First Get Them Checked By A Podiatrist, They Might Not Be Fungal! Just to reassure you, fungal nails are common. Very common. They are NOT serious but can look unsightly and cause embarrassment. They can affect not only your toenails but can on occasion, spread to your fingernails. However, not all thickened, discoloured nails are fungal in origin that’s why it’s important to get them seen by a professional. You should not start a treatment plan without first having a positive diagnosis of a fungal infection, you will be wasting your time and money. Within our podiatry clinic we can take clippings for you to take to your GP for testing. What’s The Best Treatment For Fungal Nails? Option 1 – no treatment. If your test comes back positive for a fungal infection you can choose not to start any treatment. It will not go by itself, it may not spread but it won’t disappear. If it doesn’t bother you, this is what you may decide to do. Option 2 – topical nail lacquer ‘Amorolfine’ if the infection is limited to 1-2 nails and does not involve the matrix. Published data on the lacquer, applied 1 x week for 6 months showed efficacy of between 54-64% for toenail infections. Nail polish can be applied during this period but must be removed once a week for one day to allow the lacquer to be effective. You can then reapply your polish. We prescribe this lacquer in our clinic. We recommend clinical reduction of the nail every 8 -12 weeks alongside this home treatment. Option 3- Terbinafine tablets from the GP which you would take daily for 3-6 months. There are some associated side effects, headaches, itching and diarrhea. This treatment is suitable for nails which involve the whole nail and matrix and for numerous nails. We would advise returning to clinic every 3 months for reduction of the nail. Option 3 – Surgical removal of the nail under local anaesthetic. The whole nail can be removed and once healed the skin can be treated for the fungal infection using a topical spray or cream. We would carry out this procedure in our clinic without the use of a chemical to allow the nail to regrow. Option 4 – Fenestration of the nail plate. In clinic we can drill tiny holes into the nail to allow penetration of the anti fungal product to the nail bed, rapidly accessing the site of the infection. Recent studies show significantly greater improvement in the appearance of the toenails and higher cure rates compared with topical treatment alone.This treatment may be performed within the clinic during a routine podiatry treatment unless a longer appointment slot is required. Option 4 – Nail Softening Cream. You apply the cream to the infected toenail and cover with the waterproof plaster repeating daily for 2 weeks, this softens the nail allowing you to scrape off the infection. Not suitable for every person, depending on the thickness of the nail and can get a bit messy! It is important to point out that a topical athlete foot cream is no substitute for a topical nail treatment. Concentrated Tea tree oil has been found to cause contact dermatitis and is NOT recommended. Dilute Tea tree oil has little to no effect on fungal infections to be considered an effective stand alone treatment. 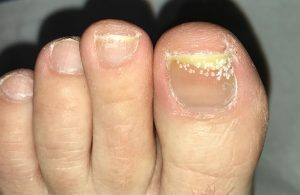 When commencing any nail treatment, it is important to treat the affected skin, socks and shoes at the same time to prevent re-infection and to improve treatment outcomes. For further advice and treatment contact Buxton and Chapel Clinics 01298 937921 and Bakewell 01629 259672. We look forward to seeing you soon!